Cyberphysical systems are the backbone of the global infrastructure we rely on for transportation, power, and clean water, and are growing at an exponential rate. The deep integration of physical and software components is not without risks and most industries are technically and organizationally unprepared to conduct forensic examinations. The ability to trust cyberphysical systems is dependent on our ability to definitively identify and remedy cyber interference, which is dependent on our understanding of how data flows impact the physical world. There are broad lessons from the USS McCain cyber assessment that highlight the type of forensics needed to build and sustain cyberphysical infrastructure around the globe. In order to prevent and respond to future cyberphysical events, whether malicious or accidental, the Navy and organizations dependent on cyberphysical systems must establish post-event procedures for cyber forensic investigations, develop trusted images, and integrate threat intelligence with engineering teams. Post-incident shipboard forensic examination is a unique activity that is separate and distinct from cybersecurity evaluations or responses to network intrusion or malware. Typically, when cybersecurity operations centers observe malicious communications or indications of compromise within their operating network, they have a clear map of the network and key pieces of information, such as an initiating IP address or malware signatures, from which to begin the forensic mission. They start by identifying and classifying malware on the offending endpoint and can take immediate actions to observe the adversary in their system and identify what is being targeted, while simultaneously acting to clean and quarantine the network. In stark contrast, post-incident cyberphysical assessment requires an undirected baseline on a variety of media, including hard drives from voyage management systems, machinery control stations, and IT network endpoints. Greatly complicating post-incident response is the fact that many segments of the network will likely be shut off by design or physically destroyed by the casualty itself. The task of cyber forensic teams is essentially the equivalent of trying to determine why a building collapsed without blueprints, physical access to the structure, or any data on what happened immediately prior to the collapse. The technical understanding and research required to define standard operating procedures for shipboard cyber forensic investigations do not currently exist. 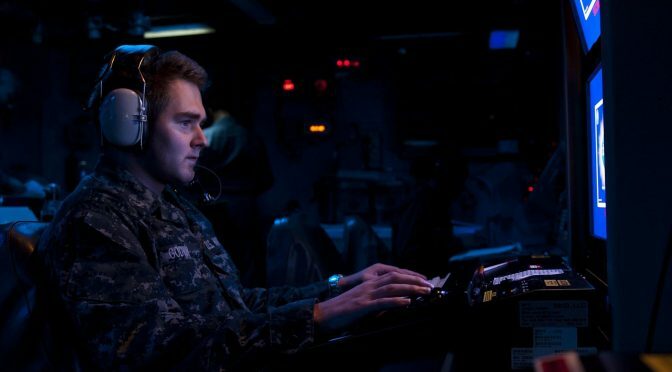 While the task of developing a comprehensive approach to shipboard cyber forensics is daunting, the military has experience developing specialty training paradigms, such as submarine navigation and tactical aviation. Hunting a cyber adversary in industrial control systems is a complex task requiring unique operational and tactical expertise. An achievable near-term milestone would be to create procedures for an attack surface assessment for a routine pre-planned mission, which could provide a test-bed for developing more comprehensive procedures, as well as a better understanding of capabilities and gaps. All ships operate three main networks: the voyage network that supports the safe navigation of the vessel, the engineering network that controls propulsion along with material handling and auxiliary systems, and the administrative network that supports business operations and crew welfare needs. U.S. Navy vessels also have a combat systems network. The interconnectedness of operational and information technology networks means that traditional information technology tools and perimeter-based security solutions are inadequate for cyberphysical systems. For example, the addition of even simple PKI security can overwhelm the processing power of installed cyberphysical processors and cause a system crash instead of preventing unauthorized access. Additionally, in order for systems like GPS to function, the system must allow access to all properly formatted traffic, rendering perimeter defense insufficient. Security for complex cyberphysical systems requires capturing data flows and developing contextually aware algorithms to understand the dynamics during shipboard operations. To generate network situational awareness sophisticated enough to do cyber forensics, the team will need to search for electronic anomalies across a wide range of interconnected systems. A key component of anomaly detection is the availability of normal baseline operating data, or trusted images, that can be used for comparison. These critical datasets of trusted images do not currently exist. Trusted images must be generated to include a catalog of datasets of network traffic, disk images, embedded firmware, and in-memory processes. 1. Network Traffic: A common attack vector is to find a computer that has communications access over an unauthenticated network, which issues commands to another system connected to the network (i.e. malware in a water purification system issuing rudder commands). Cyberphysical forensics require network traffic analysis tools to accurately identify known hosts on the network and highlight anomalous traffic. If the trusted images repository contained traffic signatures for every authorized talker on the network, it would allow forensic teams to efficiently identify unauthorized hosts issuing malicious commands. 2. Disk Images: Every console on the ship has a disk that contains its operating system and key programs. These disks must be compared against trusted images to determine if the software loaded onto the hard drives contains malicious code that was not deployed with the original systems. 3. Embedded Firmware: Many local control units contain permanent software programmed into read-only memory that acts as the device’s complete software system, performing the full complement of control functions. These devices are typically part of larger mechanical systems and manufactured for specific real-time computing requirements with limited security controls. Firmware hacks give attackers control of systems that persist through updates. Forensic teams will need data about the firmware in the trusted image repository for comparison. 4. In-memory Processes: Finally, advanced malware can load itself into the memory of a computer and erase the artifacts of its existence from a drive. Identifying and isolating malware of this nature will require in-memory tools, training, and trusted images. In addition to the known trusted images, future forensic analysis would benefit from representative datasets for malicious behavior. Similar to acoustic intelligence databases that allow the classification of adversary submarines, a database of malicious cyber patterns would allow categorization of anomalies that do not match the trusted images. This is a substantial task that will require constant updating as configurations change. However, there are near-term milestones, such as the development of shipboard network monitoring tools and the generation of reference datasets that would substantively improve shipboard cybersecurity. As future shipboard assessment teams work to confirm or refute the presence of cyber interference, they will need the assistance of a cyber intel support team to validate assumptions about their findings aboard the vessel. The basic flow established in the USS McCain investigation was to look at the physical systems involved in causing the collision (i.e. propulsion, steering) and then begin looking for cyberattack vectors to those systems. Ruling out cyber interference requires evidence of absence, which can be uniquely challenging. In order to refute a particular attack vector, coordination with a cyber intel support detachment is essential to understanding the range of possible cyberattack scenarios for a particular physical effect. For example, advanced cyber effects could be delivered over a radiofrequency pathway. Therefore, cyber investigators will need to understand the electromagnetic environment the ship is operating within, as recorded in national systems, and give access to analysts capable of identifying anomalies in the signal pathway. Shipboard assessment and cyber intel support teams each have specific sets of expertise necessary to understand the full suite of cyberattack vectors and their potential impacts on shipboard systems. Cyberattack tactics are constantly changing and the highest levels of technical expertise and security clearance are required to keep abreast of the potential methods to penetrate networks and attack industrial control systems. Cyber intel teams will never have the engineering expertise to understand the full range of potential physical impacts on shipboard systems. As was demonstrated with Stuxnet and the attack on the Ukrainian power grid, the most successful cyberphysical attacks exploit the organizational gap between engineering and cyber teams. Organizational constructs for cyberphysical systems will never be straightforward because cyber risk cuts horizontally across engineering systems and traditional intelligence activities. Organizational integration between the cyber and engineering communities must be practiced and continually refined in order to prevent and respond to cyberphysical interference. A near-term milestone would be to execute joint training exercises between the cyber intel and engineering communities in order to promote cross-disciplinary understanding and begin to build out the template for future organizational integration. Network connectivity in industrial control systems has revolutionized the way humans interact with physical systems and ushered in a new era of capabilities from energy generation to manufacturing to warfighting. These advancements are not without risks, and to avoid cyberphysical catastrophe, the development of tools to ensure resilience, security, and safety must keep pace. Shipboard forensics provide a prime example of the current gaps in our ability to understand, monitor, and protect cyberphysical systems. The lessons learned from the forensic examination of the USS McCain can provide the foundation for the procedures, data, and organizational constructs required to create modern tools to monitor and protect cyberphysical systems. Zac Staples had a 22-year career in the United States Navy as a surface warfare officer specializing in electronic warfare. His final tour was as the Director of the Center for Cyber Warfare at the Naval Postgraduate School, where he led inter-disciplinary research and development teams exploring cyber capability development. Zac holds a B.S. in engineering from the U.S. Naval Academy, a Masters in National Security Affairs from the Naval Postgraduate School, and is a distinguished graduate of the Naval War College. Maura Sullivan specializes in systemic risks and data-driven emerging technologies. Maura was the Chief of Strategy and Innovation at the U.S. Department of the Navy, where she developed and implemented the strategic roadmap for emerging cyberphysical technologies. Previously, Maura led a start-up within the global catastrophe risk company, RMS, developing software and consulting solutions for managing systemic risks for financial and insurance markets. She was a White House Fellow, has a Ph.D. in epidemiology from Emory University and a B.S and M.S. in earth systems from Stanford University. Zachary Staples (USN, Retired) and Maura Sullivan, PhD are the co-founders of Fathom5, a maritime cybersecurity company. Excellent article and balanced analysis. Fantastic analysis if you are selling a cyber security product…..how about teaching sailors seamanship? See that big glass thing in front of you? That’s a window….look out of it from time to time. I’ve had to dial up the OOD of a carrier on CH 16 in the middle of the night while singlehanding a small sailboat 40 miles offshore while transmitting AIS, with a radar reflector and running lights to TELL them where I was, in this case less than 5 miles off their port bow. This isn’t primarily a cyber security issue folks…..
Pweisskopf, I think you are absolutely correct. Effective preparation for forensic analysis is no substitute for good seamanship. They are both required for sailing a fighting computer in harms way in the 21st century.